Apart from being able to smile, eat, speak and look better; dental implants prevent the onset of poor facial profile due to loss of bone mass in your jaw bone. 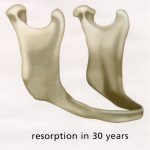 Natural jaw bone is only designed to last approximately 30 years before it completely deteriorates and dental implants are not an option. 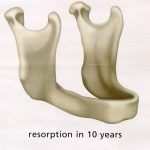 Implants prevent bone loss by transmitting load forces during the chewing process down into the jawbone. 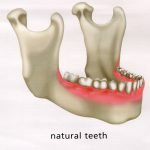 The jawbone reacts to this loading by increasing the bone density. Implants are well known in their ability to stop bone loss and restore facial skeletal structure while significantly improving nutrition. Dentures fixed to dental implants will give you an enhanced improvement in your quality of life that standard dentures cannot provide. McGill University in Toronto conducted a study to determine if people, especially the elderly, can improve their chewing ability and nutrition if they wear dentures anchored by implants. After 6 months, the group with dental implants did not only increase their body fat but blood tests recorded significantly higher levels of albumin, hemoglobin (Iron) and vitamin B12 – all indicators of nutrition. The study group also reported significant improvements in their ability to chew meat, hard vegetables, nuts and did not avoid foods they did in the past. Dental implants are medical grade pure titanium devices that are placed into the jawbone. Titanium is used in other surgical procedures such as knee and hip replacements. The implants act as an anchor to provide a solid base for artificial tooth placement. Implants can secure one tooth (crown), several teeth, or replace a full upper or lower denture. Dental implants are usually performed under local anesthesia by a dental surgeon specializing in implantology. Do Denturist provide Dentures on Implants? Yes, you should see your Denturist first for a consultation about dental implant options . Your Denturist will then refer you to an oral surgeon or implant specialist and will work in tandem with them to ensure you get the best treatment available. Your Denturist is the person that will create the final restoration (dentures) and needs to be involved in the planning stage so that the implants are placed in the most ideal position for fit, function, and aesthetics. How long have dental implants been available? Although the first dental implants are over 2000 years old, they have only been a viable alternative in the last 35 years. Anyone in reasonable health who wants to replace missing teeth; those who are dissatisfied with their present denture; those people who would like to eat better and with more comfort, smile more frequently and feel more secure when they talk and laugh. Age is not a deterrent. Anyone healthy enough to undergo routine dentistry is healthy enough to have dental implants placed. The oldest known patient with dental implants is 91 years and the youngest is 15. There is 98% success rate if the treatment is properly planned, the prosthetic is fabricated correctly and the prosthetic is properly maintained by the patient. There are factors, however, beyond the control of both the dentist and patient that can affect the life of an implant. Lifestyle changes, heavy smoking, uncontrolled diabetes, accidents, illnesses, and some medications can have a negative effect. How do I choose a dentist that does the highest quality implant at the most economical cost? Your dental team trained in placement of dental implants can provide you with a thorough consultation to bring about the best treatment alternatives available to meet your present budget. The discomfort experienced after the placement of implants is generally equivalent to that experienced from the extraction of a tooth. The use of dental implants is designed to help you avoid pain and discomfort. The entire process typically involves 2 or 3 trips to the implant specialist over a 4 to 5 month period. Along with normal brushing and flossing, a periodic check-up with your dentist and denturist is required. Your dentist will check the individual implants and clean around the posts if necessary. Dental implants do not suffer from normal teeth problems such as decay and hot/cold sensitivity. Yes, it is normal to have some level of anxiety towards dentists. Most dental fears are related to a bad experience. Today’s dental practices are capable of assisting you in dealing with those fears to enable you to have the opportunity to improve our overall physical health and appearance. The cost of implants and the surgery itself, is not generally covered by dental insurance. However, this investment in your quality of life is tax deductible, and therefore more affordable than it might seem at first glance. Dental implants are tax deductible and financing options are available. At your consultation, the Denturist will be able to inform you of the cost of the implants and dentures.